It has Far Less Benefits but is Nearly Double the Price! Hard to Clean Under Bed! What You Need To Know. Don't Be Fooled! The Sleep Number® Bed advertising cost can amount to over 100 million dollars annually. The cost is tacked onto the cost of their mattresses. So, if you purchase a Sleep Number® Bed, you will be paying hundreds of dollars (about half its price) just for the advertising cost. That does nothing for you! The main advertised feature of the Sleep Number® Bed is adjustable firmness. This feature is available on many air beds that cost hundreds less! 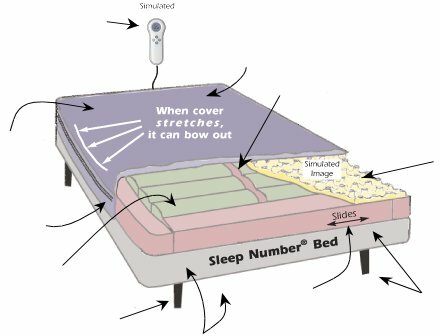 The Sleep Number® foundation and legs are huge space wasters that permit unhealthy dust to accumulate under the bed where it is impossible to remove. The legs provide only a small number of support points that allow the plastic foundation to flex and break. You pay up to $620 for a product that has less support, wastes valuable space and allows dust to collect under your bed - in our opinion, a very poor investment! The Sleep Number® inflator controls only adjust in increments of 5 points, so they are not precise. They can also lack key functions, such as "memory" and "fast-fill". Most importantly, Sleep Number® Beds that cost less than $4,300 do not have memory foam, which is critical for alleviating the pain-causing pressure points that disturb sleep. Our Pure Health® Bed has far more benefits and none of the Number Bed® problems. It can also save more money than it costs!